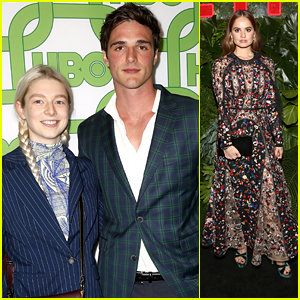 Keith Powers Photos, News, and Videos | Just Jared Jr.
Jacob Elordi steps out for HBO’s Official Golden Globe Awards After Party with his Euphoria co-star Hunter Schafer held at Circa 55 Restaurant on Sunday night (January 6) in Los Angeles. The two actors stepped out for the bash just after the first look of the new series was released. Check back to watch it on JJJ soon! Debby Ryan and Emily Osment were seen at Netflix‘s party; while Danielle Macdonald, Skyler Samuels, Violett Beane, Virginia Gardner, Larsen Thompson, Crystal Reed, and Keith Powers all attended InStyle And Warner Bros. Golden Globes After Party. Figure skaters Alex and Maia Shibutani stepped out at FOX, FX and Hulu 2019 Golden Globe Awards After Party; and Alexis Ren, Inanna Sarkis, and Anne Winters were all seen at Amazon Prime Video’s Golden Globe Awards After Party at The Beverly Hilton Hotel. FYI: Virginia is wearing a Theia dress and Loriblu shoes. Debby is wearing an Elie Saab dress and Swarovski earrings. 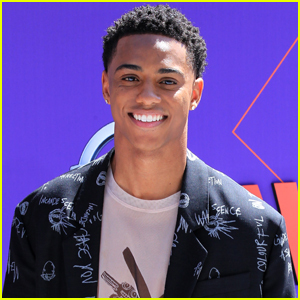 Keith Powers has found his post-Famous in Love gig with Netflix. The actor, who previously starred on the Freeform show as Jordan, will be starring as Todd in What/If, Deadline reports. What/If explores the ripple effects of what happens when acceptable people start doing unacceptable things. Each season will tackle a different morality tale inspired by culturally consequential source material, and the power of a single fateful decision to change the trajectory of an entire life. Keith also starred in Netflix’s Reality High movie, which you can stream on the service now. Keith Powers is celebrating his Men’s Fashion Post Magazine cover! The 25-year-old Famous In Love actor stepped out at the launch party on Thursday night (June 28) at Skybar at The Mondrian Los Angeles in West Hollywood, Calif.
Keith posed alongside the mag’s “Young Issue” before enjoying the evening with friends. Guests enjoyed sipped on drinks including Essentia Water and hit the dance floor thanks to tunes from DJ Jeanne Keitzman. Keith Powers wears camouflage pants while out in Larchmont Village on Thursday (June 21) in Los Angeles. 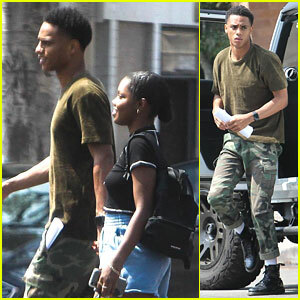 The Famous In Love actor completed his military look with a green shirt and black boots as he was joined by girlfriend Ryan Destiny. The status of Keith‘s Freeform show is currently up in the air. We really hope it gets picked up for a season three! Keith was recently honored for his acting at the Toast To Young Hollywood dinner ahead of the BET Awards weekend.